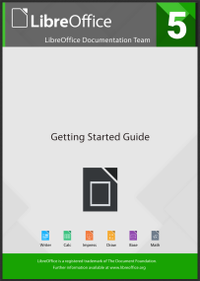 Berlin, March 6, 2017 – The Document Foundation’s Documentation Team announces the immediate availability of the new Getting Started with LibreOffice guide version 5.2. The guide was updated to include the developments of LibreOffice 5.2 and previous releases. The Getting Started guide is an introductory text for end users on using the LibreOffice office suite. It is written for individuals as well as organizations that deploy LibreOffice as their preferred office suite tool. The text allows users to get familiar with the features and resources of LibreOffice and shorten the time to become productive in office document edition. The guide is written in LibreOffice Writer in Open Document Format (ODF). The team worked to not only update the contents but also to clean the formatting used in the text with a double objective: One is to make the text suitable for computer aided translation (CAT) tools and the other is to generate an online version (XHTML) of the guide. The documents composing the Guide were formatted using styles only, avoiding direct formatting that has impact on CAT tools and on HTML export. For HTML export, the underneath template of the documents was adapted to handle the unmatched formatting properties between ODT and XHTML. At the end, a unique content source was able to produce the guide in ODT, PDF and XHTML formats.